ABOVE: The Italian architect Giancarlo De Carlo designed this council estate on the peaceful island of Mazzorbo. 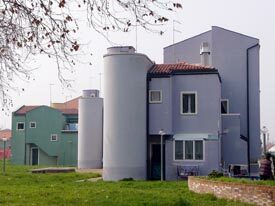 The most interesting sight on Mazzorbo, at least for fans of architecture and urban planning, is the government-assisted "case soziale" housing project designed by Giancarlo De Carlo. The houses, which are painted in Buranese colors, were built from 1979 to 1986. My favorite touch is the nursery and florist's shop with colorful tile trim.